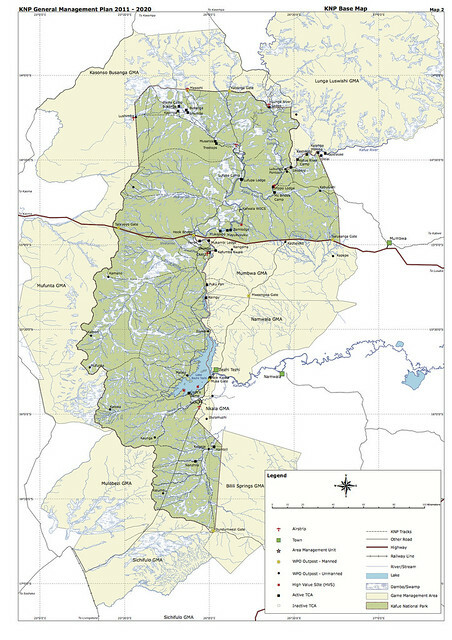 Southern – Ngoma area and, in the far south – Nanzhila. NB – Most spellings here are probably wrong! However the attached map should help you make sense of it all! For short breaks the easiest place to get to is the central portion of the park in the Chunga area. This is because you can reach the park gate in 2 hours and be sitting by the river drinking a beer in just over 3 hours. To get to most of KNP take the Mumbwa Road out of Lusaka. From Lusaka west to Mumbwa is about 1.5 hours. Fill up with fuel in at the Total station in Mumbwa – last chance but be warned there is not always fuel in Mumbwa although the black market guys will usually be hanging around with some if the pumps are dry. To get to the central and southern parts of the park keep going along the tar road (Mongu Road) at Mumbwa. After about ½ hour you get to the Nalusanga Gate. You sign the book here but do not pay or anything. After this gate everything on the RHS is park and LHS is Game Management Area (GMA). This is evidenced by the fact that there are some villages etc on the LHS but not on the RHS. After about another ½ hour there is a clearly signposted turnoff to Itzhi-tezhi on the LHS. This is the route to the southern part of the park which is accessed via Itezhi-tezhi –(see below). To get to the central part of the park keep going on the main Mongu road and after another ½ to ¾ of an hour you get to the Hook Bridge over the Kafue. From Itezi-tezhi turnoff to Hook Bridge look for game on both sides of the road. It is not uncommon to see roan, sable, zebra, elephant, along this stretch and lion, elephant, cheetah have also been seen, as well as the more common animals like impala, puku, warthog. The closer you get to the river the more chance of seeing game. Once you cross the bridge it is park on both sides of the road. Just before Hook Bridge there are 4 camps / lodges. Mukambi (www.mukambi.com) (LHS and in GMA) , Mayukuyuku, (www.kafuecamps.com) Zamlodge and Mukombo (all RHS and in Park). We have stayed at the first two and both are recommended. The other two – I cannot comment. All have camping I understand. If you stay in the GMA (Mukambi) then ZAWA camping fees are not payable nor are park and vehicle fees unless you actually go into the park. All you pay are Mukambi camping fees of $15 per person per night and the ZAWZ park fees ($15 pp p day plus a nominal fee for locally-registered vehicle) if you go into the Park. However Mukambi camping is probably not available this year as they are making changes so perhaps Mayukuyuku is your best bet. Wherever you stay in this area the best game drives are in the Park over the bridge and up towards Chunga which is Park HQ North. There are 2 roads up left to Chunga, the second is better than the first and all weather. Do not drive the first (known as 17) first left turn over the bridge – opposite the main road north, unless you are sure that it has been graded and dried out or you will either get stuck in black cotton soil or have a very bumpy ride indeed!. Ask at your camp the state of the road. There are good roads and game viewing loops around Chunga area. The best is the Shishamba loop around the Shishamba River. This is good lion country and there is heaps of other game. Best to get a map and local knowledge from your camp. For this part of the park fees are payable at your camp to the resident ZAWA scout – normally on departure and on a bit of an “honour” system if you have been self-driving. However – don’t try and avoid paying – the Park needs the cash desperately and on the whole ZAWA is doing a good job on a tight budget. To get to the southern part of the park turn left to Itezhi-tezi and be prepared for a 2 hour bad road. Itezhi-tezhi (small town next to huge lake) has fuel (during office hours only) but you need to get this from ZESCO. Go to the ZESCO offices at the top of the hill and pay, then take your receipt to the bottom of the hill and fill up. Places to stay are all after the dam wall and are New Kalala (chalets and camp site) owned by Melissa supermarket. This is outside the Park so rules about park fees etc apply as above. There is another Wildlife Environmental Conservation Society campsite, Chibala, just outside the park but for members only – another good reason for joining this worthwhile organisation (http://www.conservationzambia.org). In the park not too far from the gate is the main headquarters for the south is at Ngoma. You cannot stay at Ngoma but I am told (though not sure) that you can camp at Cook’s Camp in the general vicinity on the lake. The game is good around Ngoma and the lake (the Kafue River dammed) and if you contact them ahead of time you may be able to visit the elephant orphanage which is based there. Further down the park (sandy but 4 x 4 navigable roads) still is Nanzhila Lodge (www.nanzhila.com) and campsite. Different ecosystem (plains grass etc) around here and game a bit more sparse but nice and some different species. If you are a birder this is where you see the rare black-cheeked lovebird and whattled cranes. Campsite is basic (bucket showers etc) and a bit dusty but lodge has a great location and you can hang out there and drink beer watching the animals drink at permanent waterhole. If you stay at Nanzhila then on the way out then probably not worth backtracking but drive out of park via southern gate at Dumdumwezi and join the main Lusaka – Livingstone road at Kalomo which is less than 2 hours drive from Livingstone. Note – in the dry season there is a 4×4 navigable road along the eastern bank of the Kafue from Mukambi to Itezhi-tezhi and goes via Puku Pan and Kaingu Lodges. This takes longer but it is a more pleasant drive than the bad tar. It is worth doing if you are planning on having a few days in the Chunga area followed by a few days in the southern part of the Park but probably not if you are driving straight to the south. There is a community campsite on this road about an hour (?) south of Mukambi. To get to this area turn off the tar road at Mumbwa and take the dirt road from the petrol station. Ask directions for the Lubungu Pontoon Road. There are two main places here – Hippo Lodge (www.hippolodge.com) (no camping) and McBrides (www.mcbridescamp.com) where they have a campsite. We have not been to either but I gather that both are nice and the MacBrides campsite is a really nice bush campsite. We will be going there this year. Also along the Lubungu Pontoon road is a private conservancy called Mushingashi (http://www.mushingashi.net ) outside of the park but adjacent to it on the Kafue river. This has three places to stay – campsites and chalets but is primarily set up as a private hunting area for the Lebanese owners with Bongwe safaris having one of the camps blocked booked. However, I think that you can still stay there and it is very nice with lots of game. Keep going over the Lubungu Pontoon and you get to Kafue River Camp (www.kafueriver.com). I have heard good things (esp if you are a fisherman) but we have not stayed there. This part of the park is accessed by turning right off the main tar Mongu road not far after the Hook Bridge. The turnoff is clearly marked and has a park entry and control gate. You cannot currently stay at Wilderness Safaris campsite or River Lodge at Lufupa (block booked L). However there is are Wildlife and Environment Conservation Society chalets (reasonable price I am told) at Kafwala, next to the Wilderness chalet site. To book this contact (and join) WECS Zambia. You will need to book a long time in advance and you have to book the whole camp so plan ahead and get a group of friends together. Allow at least 2 ½ hours to Kafwala and 3 ½ to Lufupa from the turnoff. The game in this area is good – especially around Lufupa and the river is pretty. Further north still there are really no options for low cost travel as on the Busanga Plains there are only expensive exclusive camps and now that Lufupa camping is no longer an option a self-drive day journey is probably not possible. Save up your Kwacha and treat yourself!